As a Personal Trainer for the past decade, I think I've forgotten more ab exercises than I actually currently know. But, these here are my Top 10 Most Effective Ab Exercises...the ones that have really stood the test of time and get the best results. 10: 2-Leg Side Kicks - Here's how to do this ab exercise. Lie flat on your back, lift both legs up in the air, keeping the feet together. Slowly guide your legs to the side, letting them tap the ground. That's the stretch part. Lifting them back up and over to the other side is your strength part. This ab exercise is great for working a bit of the obliques and strengthening the lower back muscles. 9: Frog Kicks - These are great for working the core muscles. Start in a push-up position. Keep your shoulders and your midsection steady as you guide one knee toward your same-side elbow. One foot will be off the ground, so you're basically balancing on 3 points. 8: Seated Twists - Sit down with your knees bent, heels together, and your feet just barely touching the floor. Lean back to the point where you think you're going to topple over backwards. Hold that position, then slowly twist to one side and reach behind you as far as you can. Slowly return to your starting point and then do the other side. 7: Moving Side Planks (from the hand) - To start this exercise you'll want one hand on the ground in a position that is comfortable for your wrist. One side of your body will be facing the ground and you can either stack your feet or put one in front of the other. You'll want to start with a straight line from your head to your heels. Drop your hip slowly toward the ground so you feel a stretch along that side of your body, then return to your starting position. 6: Reverse Crunches - Lie flat on your back. You can anchor yourself by grabbing onto something behind your head with your hands. Start with the feet off the ground and the knees above the hips. Draw the knees back toward your chest, letting your lower back come off the ground, then slowly return to your starting position. I find this useful for my clients because the lower body generally weighs more than the upper body, so it is putting some good stress on the abdominal muscles and it keeps the neck in a safe position because your head never has to leave the ground. 5: Plank on a Stability Ball - This would be an advanced abdominal exercise. Forearms up on the ball, 90 degrees at the elbows, and a straight line from your ears to your heels. To make this one more challenging, you can try to trace all the letters of the alphabet with your elbows. Good luck! 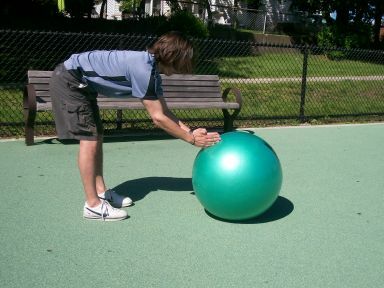 4: Kick and Reach - This one is similar to the stability ball transfer. Start with your knees bent and feet off the ground. Keep your arms straight. Come up into a crunch and reach for the sides of your sneakers. That's your starting point. Come out of your crunch, reaching as far back as you can, and at the same time kicking your legs out straight. Tap the ground with your feet and with your hands, then return to your sneaker reach starting position. 3: Slide Board Knee Tuck - For this one you'll need a slide board or a slippery surface. Start in a push-up position with the special slide board booties on or with towels underneath your feet. Keep your arms and shoulders steady. Bend at the hips, bend at the knees, and draw both knees as close to your elbows as possible. Remember not to lift your hips to high during the movement, then return to the starting position. 2: Stability Ball Roll-Out - Start from your knees (Level 1) or your feet (Level 2) with the underside of your hands on the stability ball. Roll forward, bringing your forearms onto the ball. You'll end up in your plank position for just a second. Make sure you have that straight line from your ears to your heels, then return quickly to your starting position. 1. Cable Reaches - This one I guess might be more of a core exercise than specifically an abdominal exercise, but it is one of my favorites. Using a free motion machine, set the arm at about chest height. Stand sideways to the machine, grab the cable with both hands, and bring the handle to the middle of your chest. You'll exhale as you reach as far in front of you as possible. Inhale as you bring your hands back to your chest. The toughest part of the motion should be when your hands are all the way out in front. At that point, you'll be fighting against the pull of the weight trying to bring you back to the side. So, those are my Top 10 Most Effective Ab Exercises. I hope you like them. This is a nice variety of ab exercises. I like the frog kicks and the planks on the ball.